The Alpha Series is designed to solve the current challenges of the industrial textile finishing sector: It features a sustainable and eco-friendly print technology and is designed for economic productivity and efficient processes, it minimizes warehousing by just-in-time production and produces top print quality with unlimited color and design complexity. The Alpha Series combines new process technologies to control the interactions of print heads, ink system, textile material, fabric type, pre-treatment and finishing, thereby making them reproducible with the best performance. Integrated entry for fabric rolls diam. 500 mm max. The new Alpha Series features different configurations and print widths for the digital printing of fashion garment and apparel, home textiles and upholstery. The Alpha 330 is Durst ́s flagship for the industrial production of home textiles; with a maximum printing width of 330 cm, households and decor products such as duvets, linen, table cloths, curtains and drapes, as well as advertising materials such as flags and banners can be printed in their full width. Depending on the number of print heads, the production output can vary: fully configured with 64 print heads the Alpha 330 produces up to 460 running meters per hour and the Alpha 190 up to 620 running meters per hour. The print carriage, engineered by Durst, is equipped with magnetic linear actuation to achieve the highest precision print results. The carriage and print bridge form the basis for this precise, flawless, sharp-edged output, with 2 micro-meter tolerances. With the new Alpha 190, Durst offers, especially for the fashion sector, various configurations in the entry and exit units to print on super-elastic knit fabrics. The fabric management allows very fast changes of the feeding roll. Optional: “Direct Print Kit“ for printing on coated and uncoated polyester fabric with a polyester percentage of more than 50%. Other fiber mixtures can be printed, with some restrictions. This system is designed for non-stop production and easily produces 200 m2/h. The Alpha 180 TR features a maximum print width of 185 cm and is equipped with the latest Quadro S print heads for sublimation disperse inks. Durst offers a specially formulated Dye Sublimation Ink System: water-based, odor-free, skin-friendly and free of any volatile organic compounds (VOCs). This printing system is classified for all current transfer papers at maximum quality. It creates brilliant colors, sharp images and produces an impressive abrasion-resistant and water-proof result. Durst also offers an optional “Direct Printing Kit” for the Alpha 180 TR, for fabrics needing deep color penetration like flags and banners. 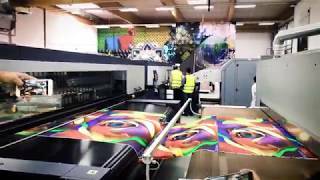 The changeover between transfer paper and direct fabric printing takes only a few minutes, and can be easily performed by a single operator.